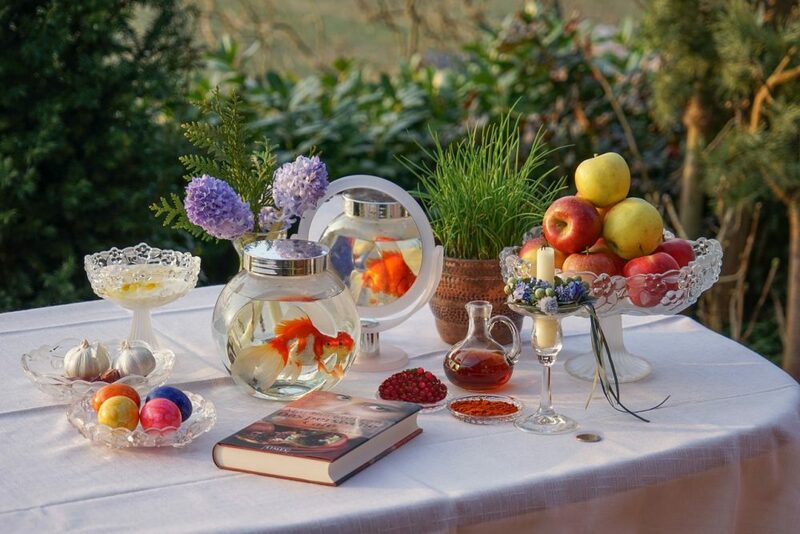 Happy Persian New Year – wonderful video! I find it interesting, dear da-Al, that you have a Hamsa design on your shirt; any special reason for it? What can one NOT find on sale in Target! Let it protect you, as a Hamsa is supposed to do. My plans for spring are: to enjoy it and take care of my flower beds, maybe start some vegetables. Happy Nawrooz to you and your husband, Daal. May it be filled with joy. Your Toastmaster’s speech was enlightening and I really enjoyed it. I love the idea of the darkest and for some the most fearsome part of winter becoming the beginning of the New Year. It says a great deal about hope and the future. I love the table. Would you be willing to explain the symbolism of the fish? What are traditional dishes served at Nawrooz? Thanks for sharing this cultural celebration. I like the man who put an orange in his goldfish bowl – a creative and compassionate solution. Interesting speech! When you was showing the picture in the book the thing that caught my eye was the Garlic. My property has a lot of wild garlic and seeing it come up is one of the signs of Spring. A relative of Garlic is “Ramps” (wild leek). Every Spring we have festivals involving Ramps to celebrate Spring. Oh yes, we have a “tall tale” about 2 brothers who are centuries old and sleep most of the year. They only wake up during Ramp season and it’s said that it’s the ramps that keeps them alive. Thank you Daal for your News Years speech. It put a smile on my face and put me in a calmer state of mind than the one I was in. Wishing you and Kashayar and all of your loved ones a very happy new year. Happy Spring, and Persian New Year! Wishing you brighter days ahead! Happy Spring – lets hope it “springs” in London soon. So proper….no jeans allowed! Unless wearing fluffy hat! Also for you and your family excellent springs. All the best. I only see food.Hahahahah Am Kenyan so we got no seasons….Just months and times of the year.